Editor’s note: The following review is part of Macworld’s GemFest 2012 series. Every weekday from mid June through late August, the Macworld staff will use the Mac Gems blog to briefly cover a favorite free or low-cost program. Visit the Mac Gems homepage for past Mac Gems reviews. I like my desktop neat and tidy—not only does it look better, it keeps my iMac running more smoothly. I like it even more when things get cleaned up without my having to lift a finger, and Desktop Tidy (Mac App Store link) does just that. This handy utility tidies up your Mac’s desktop, keeping it free of clutter. It stores all the cleaned-up desktop files and folders in a hidden Shadow Desktop, which you can access from the menu bar or in the Finder. 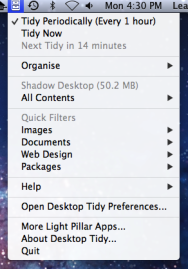 Launch Desktop Tidy, and its icon sits in your menu bar while the utility quietly works its magic at scheduled intervals—as often as every minute or as infrequently as every seven days. It even organizes your desktop items by files type, which makes finding and renaming files easy. If you find your desktop full of messy files before the next scheduled cleanup, you can choose the Tidy Now option from the systemwide menu. If you use the Growl notifications system, you can choose to have Growl notify you when Desktop Tidy performs tasks in the background. I particularly like the Quick Filters feature, which can automatically group your file types based on similarities—I use the Images, Documents, Web Design, and Packages Quick Filters. Hovering over the Images filter, for example, shows all of the images that live in my Shadow Desktop, grouped by file type. (The app’s Preferences window shows which file types as assigned to each category.) Clicking on any item in the list opens the item. If you put lots of stuff on your desktop, you’ll eventually find that your Shadow Desktop is getting pretty full. If, like me, you don’t always assign proper labels to things, the Shadow Desktop can be overwhelming to search through. Desktop Tidy can help here, too: The utility’s Organize settings let you hide older desktop items, where “older” is defined as anywhere between one day and one year. Also under Organize, you’ll find controls to bring files out of the Shadow Desktop and back to your visible desktop. Desktop Tidy is a specialized tool, but I’ve found it to be a real organizational time-saver.